Less than a month after declaring a mistrial, a Santa Maria judge reversed his ruling, freeing a 90-year-old Solvang woman who was accused of murdering her terminally ill daughter. In 2013, Solvang resident Heidi Good died at the age of 52 after suffering from ALS for several years. Prior to her death, Good’s ventilator failed. Prosecutors argued she was purposefully sedated, and her breathing machine was disconnected. 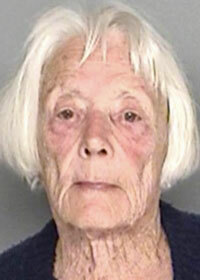 Heidi Good’s mother, Marjorie Good, recently stood trial for two and a half months. On Feb. 23, jurors deadlocked, and Judge Rogelio Flores declared a mistrial. Flores declared the mistrial in part because jurors watched media coverage of a separate verdict in the case and then discussed it in the jury room. Marjorie Good’s jury had found her not guilty of first and second-degree murder. The jurors deadlocked on a charge of involuntary manslaughter. Following the mistrial declaration, Marjorie Good’s attorney filed a motion to record the not guilty verdicts. Flores granted the motion on Monday. Prosecutors then agreed to drop the involuntary manslaughter charge. Heidi Good’s caregiver, Wanda Nelson, also stood trial for the alleged murder of the ALS patient. In February, a separate jury convicted Nelson of involuntary manslaughter, but acquitted her of both first and second-degree murder. During the trial, prosecutors argued both Nelson and Marjorie Good had financial motives to murder Heidi Good. Marjorie Good was worried she was being taken out of her daughter’s will, prosecutors alleged. The defense argued prosecutors should not have ruled out Heidi Good’s husband, Stephen Swiacki, as a suspect in the murder investigation. Swiacki contacted escrow less than 16 hours after his wife’s death and asked for a check in his name, according to the defense. Swiacki receives a $350,000 life insurance payout, a defense attorney said. Nelson is scheduled to be sentenced on April 1. Nelson’s attorney is appealing the verdict in the caregiver’s case. Her attorney–David Bixby–is a Great Guy, and did a great job. Kudos, Dave !!! Hopefully someday we will see a Dateline that shows Stephen Swiacki, finally in jail for the murder. No matter how you look at it no Good came of it. Good, sad or whatever? There are some that will protect life until the money is gone.